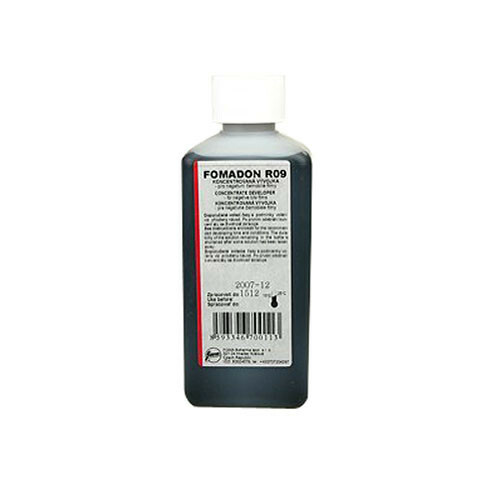 The Foma Fomadon R09 (250 ml) is a fine-grain liquid negative film developer. It has high acutance (edge sharpness / contrast), similar to Agfa Rodinal. This developer is designed for manual processing of all types of monochrome negative films. It has a very long shelf life and is used in very high dilutions: 1:20, 1:40, 1:50 and all the way up to 1:200. Less diluted concentrate produces harder and more coarse-grain negatives, while highly diluted concentrate yields fine-grain negatives with lower contrast. At 1:40 dilution, the contents of this package will yield about 6 cine-films in 2.5 cups (600 ml) of working solution. Working solution diluted in this manner can be used for up to 6 hr from preparation. Box Dimensions (LxWxH) 5.7 x 2.8 x 1.4"